An assortment of colorful cards, laminated. 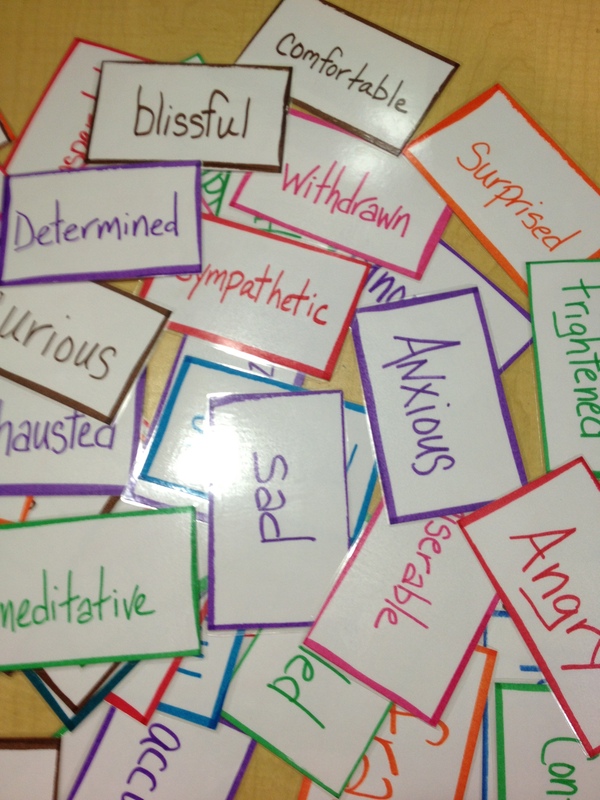 Feelings cards can be a great help in assisting your clients to identify, express, and explore feelings. In turn, clients can learn to vector their moods or regulate their affect when they better understand their feelings. I like to keep an assortment of cards handy for my clients. There are a million ways to use the cards. One nice way to use them is to assist client in mood vectoring (Neurological Music Therapy Intervention category – listed under MPC or Music Psychotherapy and Counseling ). “Mood vectoring uses music performance to address issues of mood control, affective expression, cognitive coherence, reality orientation, to facilitate psychosocial functions” (definition is taken directly from the NMT Medical Coding and Record manual – you will find it on page 20). Mood vectoring is basically a technique that employs the iso-principal to help clients regulate their affect. Improvisation is a useful method of treatment I use to employ the use of mood vectoring is the MT studio. The reason this is helpful with clients who are recovering from abuse-related trauma is because affect dysregulation is a typical problem that clients contend with and must be addressed in treatment. 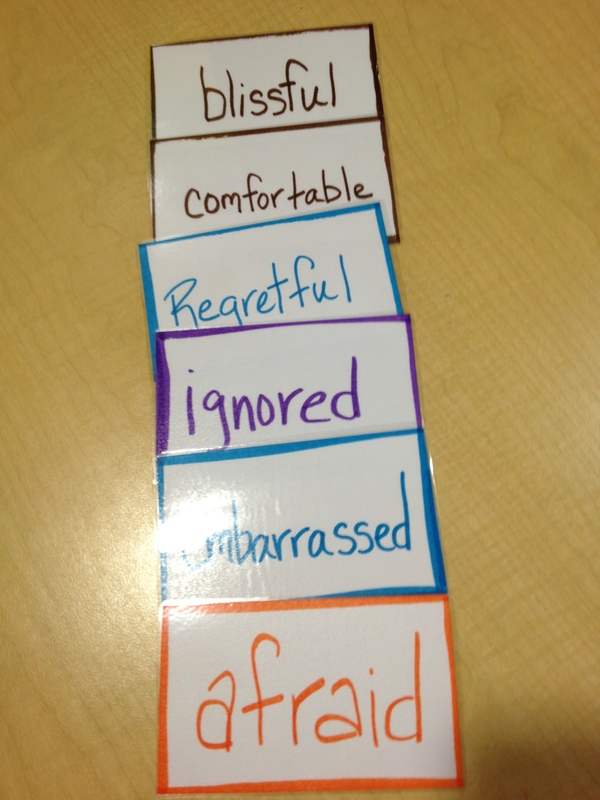 Affect dysregulation can happen for a variety of reasons as a result of abuse. Affect regulation is a symptom that can be dealt with in a variety of ways. Initially, it is best to deal with this symptom through the use of teaching basic music -assisted relaxation skills and ensuring that the client is able to rehearse and repeat the use of music-assisted relaxation in order to understand the way they can regulate their own physiology. Affect regulation is taken to another level as the client reveals triggers (reminders of the abuse) and is able to attach emotions to the experience and gain mastery over the affect associated with the emotion. The idea: In a therapeutic situation when it because clear that client needs to gain the skill to regulate affect associated with emotions, (for example, if the client is experiencing a lot of triggers and is responding with emotions that feel out of control) I place the cards on the table and have the client choose a manageable number of cards. Some can only manage 2 or 3 cards and others can manage 5 or 6. Once the client has chosen the cards I have them place the cards in order of intensity. Using that order of intensity, therapist guides client through an improvisation with the cards. I employ the use of “therapeutic givens” (See Bruscia reference below) to guide the experience: Client may choose every aspect of the improvisation intervention including instrumentation, tempo, volume, pitch, etc.. Therapist allows client to be the “leader” and therapist offers support for the client. Therapist uses a “therapeutic given” by letting the client know that they will musically support the client (using methods of support outlined by Kenneth Bruscia’s Taxonomy of 64 Clinical Techniques in ) so that the signal to end each emotion or the entire intervention is understood by therapist and client. The experience is designed to give the client a sense of mastery over the level of intensity of their emotions, showing them that they have the ability to regulate their affect and express their feelings in a way that doesn’t harm anyone (including themselves) and that they can do so in a variety of situations. You may want to experiment with the intervention a little by having the client go in different order to explore how the intensity is when reversed or mixed up (because life is never in the correct order – right?). The idea of rehearsing this procedure, intervention or protocol is consistent with methods of NMT in that the rehearsal is building new skills, new neural pathways. You can rehearse the mood vectoring in response to client-identified triggers, which helps transfer the client’s skill into daily life. Bruscia, K. (1987). Improvisational Models of Music Therapy. Springfield, Il: Charles C Thomas Publishers. This entry was posted in Intervention Ideas and tagged dysregulation, feelings, improvisation, mood vectoring, triggers on July 22, 2013 by taniacordobes.